Regardless of the occasion, I’m not always inclined to slave over a complex, albeit delicious, new recipe. I want to look in my pantry knowing I have those few simple ingredients to satisfy my craving or indulge my friends. Now I am all for spending hours in the kitchen crossing items like homemade challah, bolognese, and pizzas off my to-cook list. But sometimes… you just need a cookie. 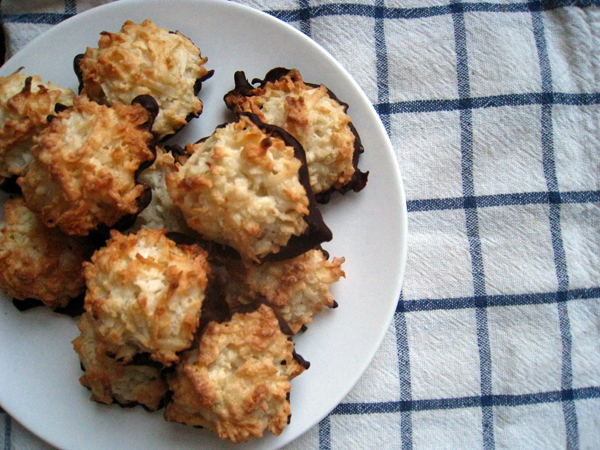 Time and time again I have turned to my dear friend Natalie’s coconut macaroons to simply fill the sweet void in my life. And they always do the trick. These macaroons are somewhat legendary among parts of Central Virginia, as they have a tendency to brighten everyone’s day. They have served as thank you presents to countless professors, and birthday presents for co-workers and friends. They have graced many a potluck dessert table, passover seder, and holiday cookie swap. But let’s be honest — who needs an excuse to make cookies?! Preheat oven to 350°F. Line baking sheets with aluminum foil or parchment paper. Bake for 12-16 minutes in the middle of the oven until puffed slightly and very lightly browned at the tips. Let cool on rack until while you prepare chocolate! (Reserve foil/parchment lined cookie sheets for dipping). 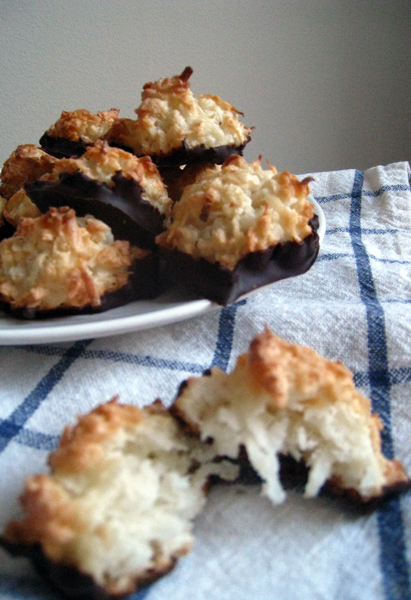 If you opt for chocolate-dipped macaroons (and really, why wouldn’t you? ), melt the chocolate on the stove in a double boiler, or in 30-second intervals in the microwave. See Cara and Phoebe’s Prep School video for tips! Once chocolate is melted, dip the bottoms of the cooled cookies into the chocolate, wiping off a bit of the excess with a rubber spatula. Once the chocolate has hardened, enjoy!